The incredible stories of the New Zealanders who have been awarded the Victoria Cross for courage under fire, from WWI to the war in Afghanistan. Here are the stories of the 27 men who won the Victoria Cross in both world wars and in Afghanistan in the 21st century - fighting heroes who risked their own lives to save their fellow men or change the course of a military action. All three services are represented here, and the stirring stories of wing walkers, daring raids, courageous advances against huge odds, and awe-inspiring courage under fire make it a fascinating and invaluable addition to our historical record for children. A simple introduction to each man is followed by an account of how he won his award, and what happened to him afterwards. Poignant and inspiring, the tales of self sacrifice courage and extraordinary deeds by otherwise ordinary men in the field of battle will provide excellent background material for history and language units. An excellent resource for motivating reluctant readers, especially boys, and well suited to classroom and individual reading. 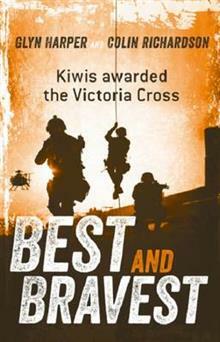 Best and Bravest is the children's version of the fully revised and updated In the Face of the Enemy, (also publishing in 2016) and includes the story of Corporal Williw Apiata, the most recent soldier to be awarded the VC.